A ride through downtown Lima reveals endless chifa restaurants, bakeries, cebicherias, outdoor markets and street food stands. 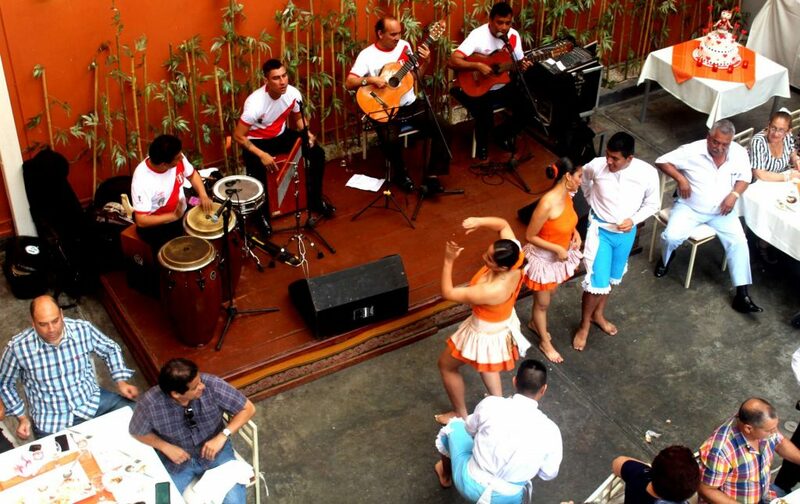 Lima, Arequipa and other major Peruvian cities have a strong cultural identity that is built on food – well, and soccer! – and rightly so (on both accounts). In a process impossible to recreate, Peruvian cuisine has evolved from centuries of varied cultural influences to make it what it is today: a mouthwatering flavour explosion hardly found anywhere else (in my humble opinion!). It all started with bold experimentation that cultivated and enhanced native ingredients found in Peru’s three rich and distinct regions: the Pacific Coast, the Andes Mountains and the Amazon Rainforest. Culinary indigenous foundations were then sprinkled with European-influenced flavours, and mixed with a spoonful of Asian and African traditions, which came from a wave of immigration. 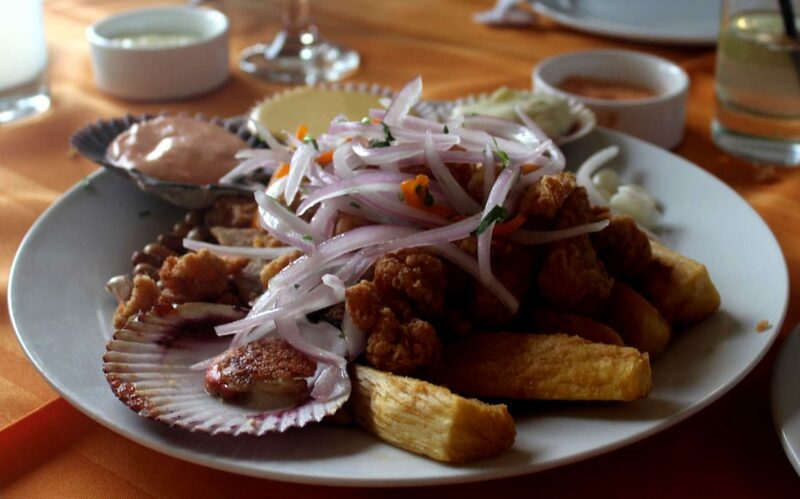 Abundant and incredibly fresh seafood and yucca fills the coastal plates of Peru. With so many outside influences, Peru’s national identity has been hard to pinpoint, but food has helped the country and its citizens find their authenticity and cultural pride. You’ll definitely have to make a detour on the way to Machu Picchu to try some of the country’s most famous dishes. 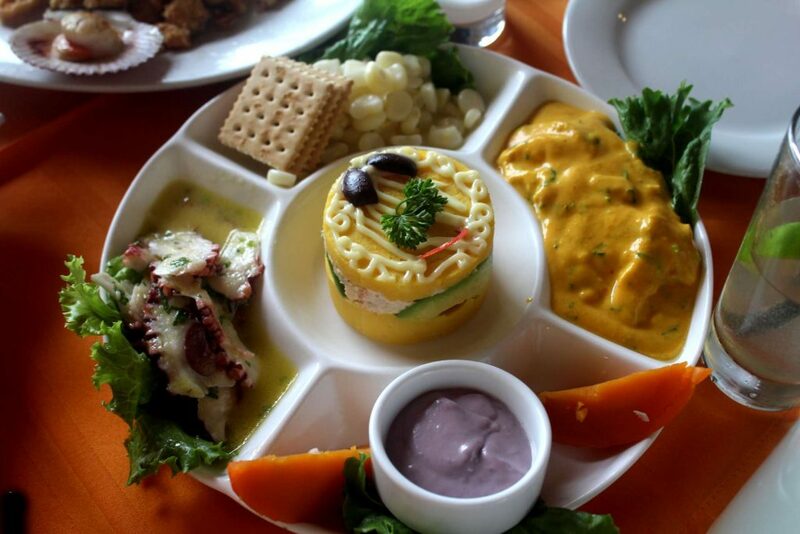 A mishmash of Peruvian eats: squid, choclo, olive sauce, tiradito, with causa taking centrestage! In recent years, the country’s cuisine has been recognized internationally, particularly due to the opening of Peruvian restaurants in places like Los Angeles, London and New York. The New York Times has called Peruvian cuisine “one of the world’s most important” due to its multicultural fusion, and if you’ve ever tasted it, I have no doubt you’ll agree. The country’s culinary movement got a little help from Peruvian food ambassadors and chefs like Gaston Acurio, with Peruvian restaurants ending up on the San Pellegrino list of best restaurants in the world. You know it’s become a culinary gem of Latin American when you see the country’s bustling food markets, Lima’s Museum of Gastronomy, and its multiple-day Mistura food festival, now recognized as South America’s largest food festival. Lima is, without doubt, the food capital of Peru and quite possibly Latin America. So if you’re an adventure-foodie, be sure to put Lima on your must-see list. 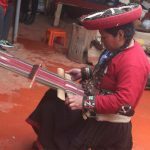 Check out these trips to PERU from some of the world’s best travel companies! 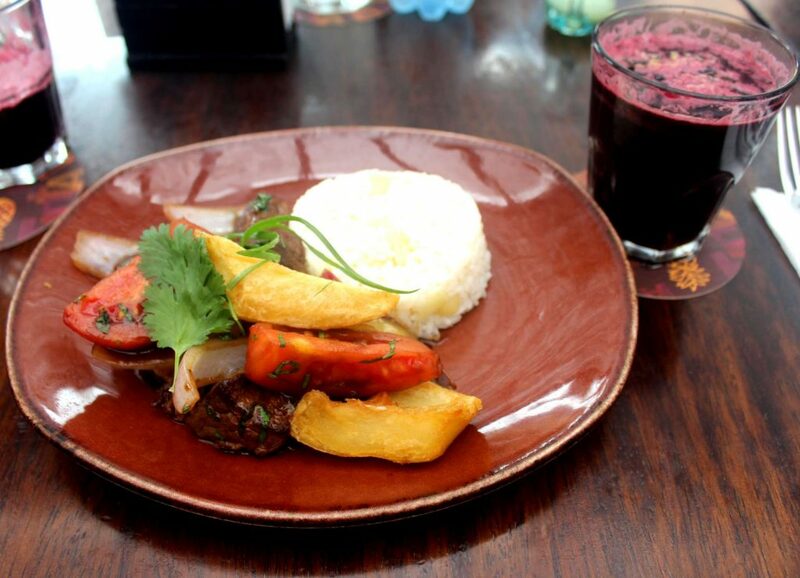 The unfolding of Peruvian history is reflected in Peru’s culinary masterpieces that are evidenced and savoured today. The pre-Columbians and then the Incas were the first to cultivate Peru’s arable land. They expertly hybridized and genetically-diversified crops, and built agricultural terraces and irrigation systems that have stood the test of time – mind-blowing when you think about it! 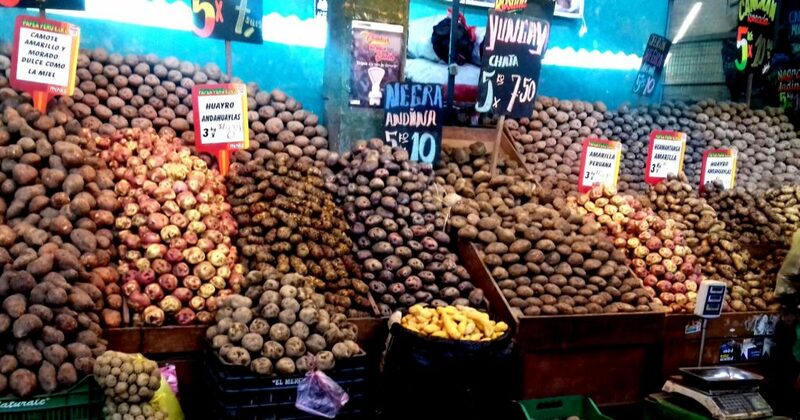 In establishing varying micro-climates through different levels of terraced farming, the ancient peoples of Peru were able to create and isolate thousands of subspecies of crops, including more than 3,000 types of potatoes (called papas in Peruvian Spanish, the word actually stems from the Quechua language). Potatoes, in case you’re unaware, are only indigenous to Andean South America, including Peru – it’s now widely thought that the ancient Andean peoples began “domesticating” (cultivating) wild potato crops as far back as 8,000 years! The Spanish, after the conquest, exported the crop across the Atlantic, and the rest is history, so to speak. The agricultural terraces built so many centuries ago are still seen (and used) around the country today. They are part of Inca citadel sites, such as Machu Picchu and Pisac, and separate sites exist that were dedicated only to farming, such as the circular-terraced agricultural laboratories of Moray, near Cusco. At Moray, the Incas experimented with growing crops at different altitudes, temperatures, and using various soils. From the top to the bottom of the terraces, there is a dramatic temperature change of 15 degrees – you’d have to bundle up in your finest alpaca sweater just to harvest from the top layers. The Incas also created storehouses (qollqas) on cliffsides (seen at Ollantaytambo, for example) to preserve crops at higher and cooler altitudes (including freeze-drying them). These Inca “refrigerators” were used in times of famine, and kept food supplies safe from attacks. The widely-connected Qhapaq Ñan, or Great Inca Road Network, served many purposes, but it also made food distribution possible throughout the empire. It’s said that there was enough food stored to feed the entire population for years. The Incas were definitely forward-thinking! Besides potatoes, indigenous staples included quinoa, kiwicha (amaranth), corn (maize), sweet potatoes, maca, other tubers like ulluco and oca, squash and fruits. Although the Incas were mostly vegetarian and stuck to a plant-based diet, they did cheat a little. In the empire, some meats were preserved and consumed, including fish, llama, alpaca and a current favourite: cuy, or guinea pig. Using nature’s elements, the Incas freeze-dried the meats and called it charqui (meaning “to burn”), which led to the English word for the chewy meat found in convenience stores around the world: jerky! The arrival of the Spanish brought new staples to the local diet, including rice, wheat, oats, lentils, chickpeas, onions, lettuce and other meats (chicken, beef and pork). But it was a give and take, so they also exported Peruvian foods back to Europe, including introducing the continent to beans, chili peppers, maize, potatoes and tomatoes (much to the delight of the Germans, Irish and Italians). 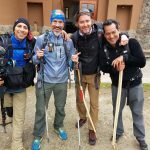 For more stories on In From the Outpost-PERU click here! With colonization, European foods were consumed in Peru, and anything that was “indigenous” was seen as food for the lower classes, leading to a diminished consumption and production of certain foods. Fortunately, in recent decades, Peruvians have prioritized bringing local foods out of obscurity. 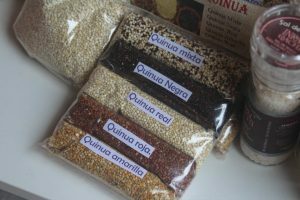 Much to the delight of hipsters everywhere, quinoa is now available worldwide, along with superfoods like maca and kiwicha, which have also been used in astronaut meals by NASA. Luckily, quinoa bounced back and made it onto health-conscious menus all over the world. When Peruvians took back their country through the independence of 1821, they also started building their cultural identity as an independent republic. One infamous story recounts how during the war with Chile in the 1880s, Peruvian housewives would hawk food on the streets and collect money “for the cause,” (“por la causa”). One dish they sold was a chili and lime-flavoured potato casserole with an avocado and tomato filling, which simply became known as causa (or “cause”), as it is still deliciously called today. The Asian-inspired lomo saltado goes down nicely with a glass of chichi. In the 19th century, plantations brought in Chinese workers, who carried their share of culinary traditions, resulting in one of Peru’s most flavoursome fusions – Peruvian-Chinese food! Chinese immigrants wanted to cook in their local ways, but struggled to find the ingredients, so the result was a Chinese cooking style using Peruvian ingredients (just when you thought Chinese food couldn’t be topped). You won’t need chopsticks for the lomo saltado, a Chinese-Peruvian classic that was born when a Chinese stir-fry was made with Peruvian meat, potatoes, tomatoes, spices and Chinese rice, soy sauce and vinegar, all cooked in a wok. The Peruvian-Chinese fusion managed to seep into the language when the Chinese phrase chi fan (to eat) got picked up by local slang, resulting in chifa (which is now the local name for Chinese-Peruvian food and restaurants). READ Crazy-Buzzing Capital—Is There Any Other Way to Describe Modern Lima? Chao fan, Chinese for “fried rice,” became the Peruvian-Creole version of chaufa. Fortunately, you can “chi fan” in Peruvian-Chinese restaurants all over the country, although it’s said there are thousands in Lima alone, with many of them centred around South America’s most important Chinatown, the one in the historical centre of Lima. Afro-Peruvian culture influenced food, music and the Alcatraz dance! Africans arrived in Peru with the earliest conquistadors, working in labour and on the battlefields. In the dark centuries that followed, they worked on sugarcane, rice fields and vineyards. Aiming for a taste of home using Peruvian ingredients, the resulting spice-heavy dishes were meat-based with rice, bananas and sugarcane that were readily available. The one-of-a-kind African influence in modern Peruvian cuisine includes the use of pork, sweet potatoes, garlic, onion, nutmeg, ginger and cinnamon. Besides cuisine, Afro-Peruvians have left a mark on the country’s cultural scene, notably the cajon, which is a djembe-inspired instrument, the festejo musical genre, and the folk dances from Chincha, including the Alcatraz, where a quick shake of a dancer’s hips aims to put out a partner’s lit candle. Now that’s some risky and entertaining action! It’s said that Coca Cola is the Number One soft drink almost everywhere in the world except in Peru (though apparently, that’s also true in Scotland and India). In Peru, locals love the sweet bubble-gum-tasting “Golden Kola” of Peru called Inca Kola (although I’m certain the Incas would have probably gone for the purple-corn chicha, given the choice). If you’re looking for a healthier option, open-air markets sell freshly-squeezed fruit juices. I recommend the San Pedro Market in Cusco for a vitamin boost at one of the several fruit-packed stands that blend traditional fruits, along with Peru’s more exciting (and unrecognizable) varieties. 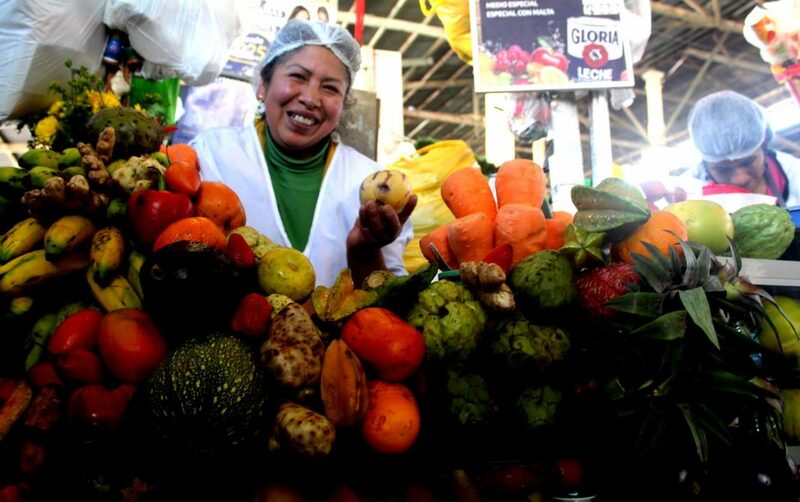 Freshly-made juices from fantastically-ripe fruits are a staple in Peru. When the Spanish colonized Peru, it is said they planted European olive trees and grapevines in the hopes of reproducing Spanish brandy. There’s no doubt the Spanish changed the face of Peru, but this contribution is probably the most widely-accepted and beloved – the introduction of pisco – Peru’s signature alcoholic spirit. Most of the current pisco production takes place along the arid coast, where you can spend productive days visiting (and sampling) pisco distilleries (bodegas) along the country’s Pisco Trail. In recent years, with the rise of Peruvian gastronomy, pisco-based cocktails have made an excellent complement to the varied culinary options. The chilcano (lime, bitters, syrups, ginger ale and pisco) and maracuya sour (a passion fruit twist to the pisco sour), join the ranks with Peru’s classic pisco sour (the powerful egg-white topped, lime-flavoured alcoholic beverage). Pisco is so respected it gets its own “museum” (an educational bar of sorts) in Lima, Arequipa and Cusco, and the pisco sour has an official government holiday: every first Saturday in February is National Pisco Sour Day. The next day no doubt, is a lazy Sunday. From my experience, Peruvians always have room for dessert. But funnily enough, most of the most well-known Peruvian desserts can be traced back to Europeans in the region. The Spanish-inspired alfajor is popular in Argentina as well, but the Peruvian version consists of a sugar cookie sandwich with manjar blanco or dulce de leche (a condensed milk-based caramel), topped with powdered sugar. 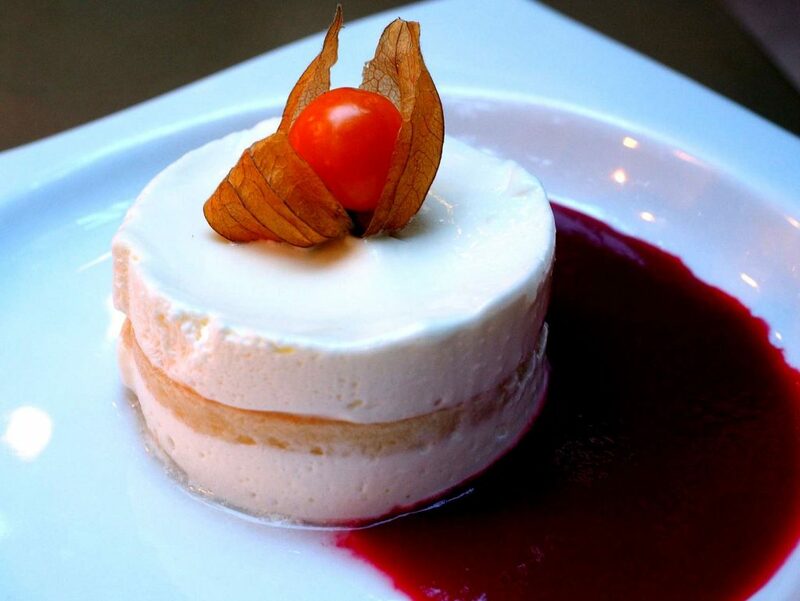 Suspiro a la limeña (named by a Peruvian poet, who once described it as soft and sweet like the “sigh of a woman from Lima,” or a limeña) is another dulce de leche-inspired meringue dessert, which derived from the Spanish blanchmange. Picarones, deep-fried pumpkin-based donuts covered in syrup (you heard that right: deep-fried syrup-covered donuts! ), also evolved from a Spanish dessert called buñuelos, which were too expensive to replicate in Peru. Similarly, the colonial version of tejas, a Spanish dessert, shelled and filled with dulce de leche, was made without costly almonds. Aguaymanto (an Andean ground cherry) tops off this sugar rush! Other Spanish-Peruvian desserts include turron (again, the Peruvian version was produced without almonds and evolved into an anise honey nougat that’s most associated with the religious ceremonies of Señor de los Milagros in October), and arroz con leche (sweet rice pudding found all over Latin America). Creme caramel, or flan, is also famous in other countries in Latin America and the Peruvian version, crema volteada, also adapted from European traditions. Paneton, a fruit cake consumed at Christmas, was brought by Italian immigrants (known as panetonne in Italy; wow, did the name ever get a Spanish alteration!). Peru ranks high on the world’s panetonne list, the sweet bread is most consumed in Italy, followed by Argentina (which has a large number of Italian immigrants), then thirdly by Peruvians. Purple corn-based desserts include the mazamorra pudding, and the api smoothie, also known as the “Inca’s dessert.” Fruits native to Peru are also found in desserts, most notably lucuma, which is popular in ice- cream and aguaymanto, and is used to make flans, jams, liqueurs and decoratively to top off desserts). Just make sure you don’t down any of these alongside Inca Kola, otherwise you’ll most definitely need a trip to the Peruvian dentist during your visit!